Nope, not a laundry cube. 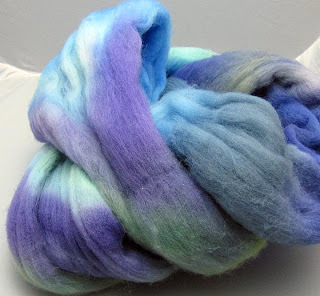 I've wanted to improve the quality of my crafting photos for awhile but Tour de Fleece brought it to a head. I wasn't happy with the colors/quality I was getting - I take most of my photos at night or in the late afternoon when the light is iffy at best - and I was also envious of some of the more professional photos being posted on Ravelry. 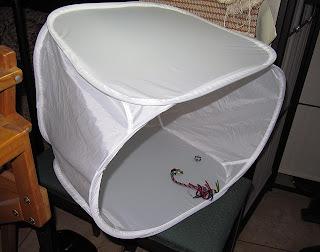 So today we went shopping for a light tent (from Dexters Camera in Ventura; great store, helpful people*) - and also brought home an Ott floor lamp that will serve as a light source for both my photography and my weaving. 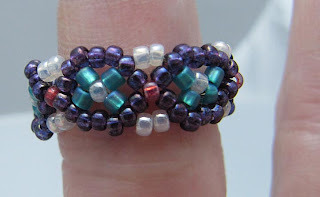 To try out my new set-up, I photographed the ring I made under Ginny's tutelage on Saturday - my first ever beaded object. The colors are pretty accurate, at least on my monitor. 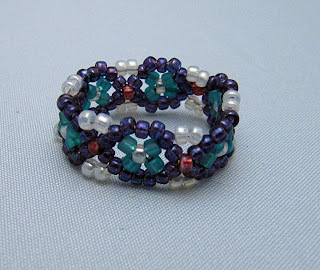 And here's my first ever Kumihimo braid, made in a morning demo during Saturday's Guild meeting. I've avoided Kumihimo in the past because I thought it would be very technical and difficult. It's not. Easy as pie and just as much fun. Can't wait to do more. 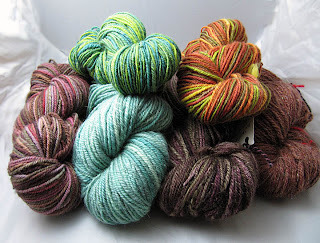 Last but not least, this is all the yarn I spun during Tour de Fleece. I need to work on the lighting and wrinkled background but I'm very pleased with how the colors show in this photo; much more detailed than the ones I've done before - especially since this was done at 9 tonight. Next up on the spinning wheel. * We went to the big box stores before heading to Dexters, which is where we should have started. The clerk said 'we don't have any light tents in stock . . . oh, wait, we have one in a kit that we're going to send back because it's missing a light bulb . . . I can take the tent out and sell you just that if you want'. I want! And I got it for a better price than if I'd bought it online. Hooray for local stores and helpful employees!